RCW89 is a faint 4 arcmin HII emission nebula in the southern Constellation of Circinus (Latin for compass, as in the drafting instrument to make circles). North is up and East is to the left and the image is 31.5 x 31.5 arcmin. RCW89 has a filamentary structure consisting primarily of H-a along with weaker OIII emissions. 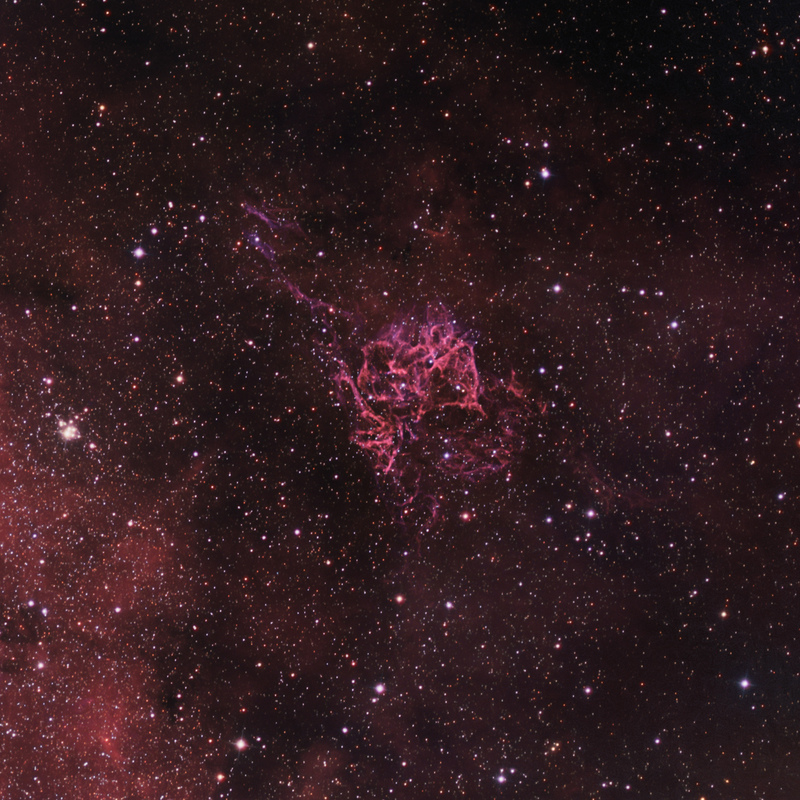 This is where it gets interesting because it is thought to be related to a large 20-30 arcmin supernova remnant, G320.4-01.2 (MSH15-52, Kes23) that is centered about halfway between RCW89 and the lower left corner of my image (southeast), which contains the bright open cluster, Pismis 20 toward the west (left) edge of the image. Yatsu et al. (Chandra Observation of the Interaction between the Hot Plasma Nebula RCW89 and the Pulsar Jet of PSR B1509-58 arXiv:astro-ph/0507049v1, 2 July 2005) suggest that RCW89 is energized by the pulsar, PSR 1509-58 from the SNR. Yatsu et al. consider RCW89 to be at the terminus of the northern relativistic jet from the pulsar where there is interaction with the interstellar medium (ISM). The SNR has bilateral radio shells with a diameter of ~ 30 arcmin. The pulsar is a 150 ms, X-Ray, radio and gamma-ray pulsar which is located at the center of the SNR. The age of the SNR is estimated to be 6-20,000 years at a distance of 17,000 light years, whereas the pulsar is estimated to be much younger at 1,700 years, but at the same distance. The brightest part of RCW89 corresponds to the brightest radio emissions of the SNR. This arrangement and energetics are likely to be similar to the pulsars and surrounding filamentary structures in the Crab Nebula and Vela SNR. This image contains 9 hours of 5 nm H-a color-mapped to red/magenta and 9.5 hours of 3 nm OIII, mapped to blue-green to achieve a natural color while takingadvantage of the high contrast of the narrowband filters to bring out the filamentary detail in RCW89. 1.5 hours of RGB data were added for star colors. Total exposure time was 20 hours.